Just when you’ve gotten yourself back on track after indulging over the holidays, here comes the chocolate and wine festival we call Valentine’s Day (or Galentine’s Day if you’re celebrating with your best girlfriends). 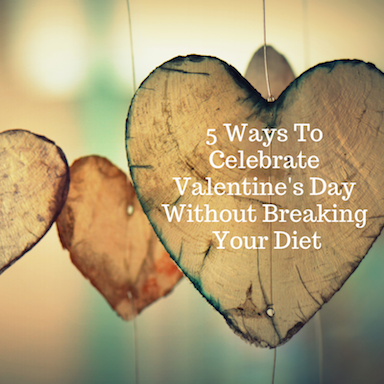 Can you still celebrate without derailing all your good intentions for healthy living? Share a walk, foot massage, or a snuggle with your favorite person or pet. Touch is an essential part of being human and we need to give and receive it often. Many people feel isolated and alone all year round. Brighten someone’s day by reaching out to visit elderly or infirmed in your area. Or contact an old friend you’ve lost touch with to let them know you care. Add your favorite essential oil to your diffuser and create an atmosphere of serenity. Choose traditional rose, lavender for calm, or ylang-ylang for sensuality. Tell your partner, child, friend, AND yourself something you really appreciate about them. Look them right in the eye when you do it and you’ll both feel fully sated with calorie-free appreciation! Set the table with linen and candles and prepare a simple, but beautiful and delicious meal of seasonal veggies and clean protein. Trying a little artful plating or serving your food in courses for an elegant and pampered feeling. Wishing you a very Happy Valentine’s Day from everyone at BeWell! P.S. Are you or do you know a Bride-To-Be? From now until March 22nd, we’re offering a very special Bride’s Total Wellness Package to help brides, grooms, and anyone in the wedding party look and feel their best on the Big Day. Find out more HERE.